WordPress has dominated content management – what next? WordPress is rapidly emerging as a de facto standard in Web content management. So what can we expect down the road, and what will it mean for the idustry? Take a look at this snapshot comparing search volume trends for WordPress to its longstanding competitors Joomla and Drupal. It’s difficult to generalise from a single chart but when you combine it with the data below from builtwith.com you get a pretty good insight into what’s going on in the content management space today. 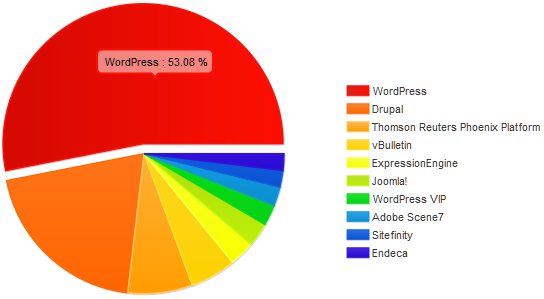 Of the top 10,000 websites that use a content management system (CMS), over half are using using WordPress. This dominance increases to 63% for the top 1 million sites. Regardless of how much room you leave for interpretation it’s clear that WordPress is crushing its competitors at an alarming rate – at least in terms of market share – and it’s not showing signs of slowing down any time soon. So what happened? How did Automattic, the creators of WordPress, manage to achieve so much success in such a relatively short period of time? Can the growth be maintained? And what does all this mean for online tech decision makers? First, although WordPress started as an open source blogging platform back in 2003, any discussion of whether it’s evolved into a real CMS petered out probably around this time last year. In fact, even this time last year, only 8% of WordPress installations were just blogs. Users seem to love it because they find it easy to update content, add functionality and tweak the design. Small companies have jumped at it because the associated costs of building and maintaining an entire site, or portfolio of sites, can scale dynamically with the business. Even larger companies, perhaps at the insistence of their users, have started to accept its role in enterprise content management. Or perhaps it’s because it costs a fraction of their proprietary or inflexible ‘enterprise’ CMS. Whatever the reason, Automattic’s official enterprise offering is certainly helping to smooth the way. By making it a relatively trivial task to add custom post types and custom taxonomies, the platform has capitalised on its early success and opened itself up to manage any kind of content, not just pages and blog posts. For instance, WordPress can be used as a perfectly capable e-commerce platform and there’s no shortage of plugin and theme vendors to help extend the functionality in that direction. 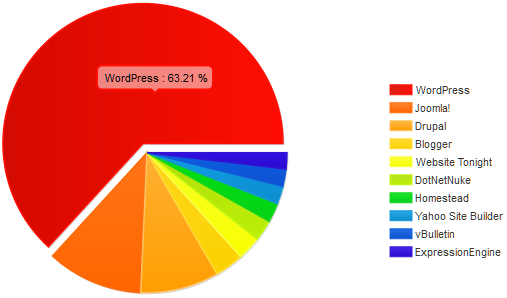 WordPress currently powers 16.7% of all sites on the Web (source: w3techs.com). That’s an impressive figure, but there there are still 69% of all sites on the Web that are not using any type of CMS at all (source: w3techs.com). So there’s plenty of room for growth without having to compete for market share. The introduction of native mobile apps for iOS, Android, BlackBerry and Windows Phone is going to play a big part in that sustained growth. Another reason for this popularity is the hugely successful WordPress ecosystem/economy. Matt Mullenweg & co. have spawned an entire global industry of WordPress-specific services including web design, development, writing services, marketing, hosting services and training. One of the key factors driving this success is perhaps Mullenweg’s controversial, but rather wise insistence that themes and plugins must adhere to the WordPress open source GPL – there are no proprietary WordPress themes or plugins, legally they all fall under the WordPress GPL. That doesn’t mean that you can’t make money and nor does it mean that you’re legally obliged to share everything you create. An inhouse development team may decide that they’ll retain their competitive advantage by choosing not to share their code. Whereas vendors of the most successful commercial plugins like Gravity Forms make their money from the associated services like support and auto-updates. This hardline stance on licensing can be difficult to understand at first but it does seem to have worked – especially for customers. It’s very easy to find the right skilled workers to customise the design or extend the functionality of a WordPress site. Right now WordPress skills are significantly cheaper than Drupal skills. This doesn’t mean that Joomla or Drupal sites are suddenly about to become obsolete – but it does mean that it’s going to become increasingly difficult to find and retain skilled designers and developers over the long term to maintain those sites – at least while WordPress continues to drain talent. At the current ferocious pace of evolution, we’ll soon see WordPress transform even further from its original blogging platform concept towards something resembling a de facto standard application framework, or app-engine, for all kinds of small to medium-sized projects. By using WordPress as a framework developers already get a lot of things “for free” (e.g. user account management, content management, caching, template engine, extensibility framework, built-in SEO, automatic updates, etc) – perhaps too many things. In fact, for some smaller projects, it may already be perfectly suitable but the lack certain features like a scalable design pattern (e.g. native MVC) may rule it out in favour of a “real” framework for some larger projects. As the WordPress core continues to be refined, however, I’m sure we’ll see a lot more WordPress-based applications popping up at department level and perhaps we’ll even see niche-specific solutions disrupting established markets. When the workflow features and user rights handling improve we’ll see a surge in enterprise adoption and this in turn will spark growth in demand for more robust third party API integration with legacy systems. We may even see multi-site WordPress encroaching on Sharepoint territory for team collaboration scenarios. Certainly some small businesses are already deploying WordPress as their primary intranet/intra-company platform and this trend looks set to continue. All of this is great news for users of course. Elements of projects that used to be coded by hand just a few years ago can now be configured in a few minutes using the WordPress admin dashboard. So we’re set to see the inevitable power-shift edge further away from developers and towards business and project owners. And that can only be a Good Thing, right?